The VIA EPIA-P720 is an incredibly compact board, based on the 10 cm x 7.2 cm Pico-ITX form factor. Taking advantage of the latest VIA VX855 media system processor, the VIA EPIA-P720 offers smooth playback of the most demanding video formats at high resolutions of up to 1080p, making it a great choice for a range of devices including today's next-generation digital interactive devices and digital signage. 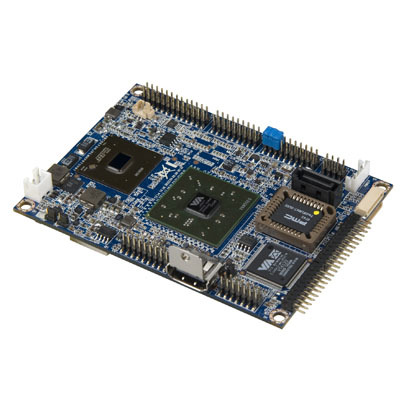 The VIA VX855 unified digital media IGP chipset provides hardware acceleration for H.264, VC1, WMV and MPEG 2/4 codecs, placing almost no strain on the board's fanless 1GHz VIA Eden ULV processor, leaving it free to focus on other tasks. The VIA VX855 also includes the VIA Chrome9 HCM 3D integrated graphics core boasts full DirectX 9.0 support and a 128-bit 2D engine with hardware rotation capability. On board pin headers provide support for an additional of 4 x USB 2.0 ports, an LPC connector, SMBus connector, PS/2 support, audio jacks, LVDS, 4 pairs of DIO and two UART ports.